The source material is from Trap Danmark in the 1960s. Changes after that time are usually not included. If the readers want up-dates, they must take this via information from the local parish or from the net. Each church/parish has a website with e-mail address and phone-number. The manor lies in flat salt marshes ab. ten meter above sea with a free view over Randers Fjord. It is not known if it was a robber's nest in the old days, from where was an fine access to the merchants' ships. The first residing here was probably by one of Denmark's most notorious men, the socalled "king's murderer" Rane Jonsen of the family Rani. 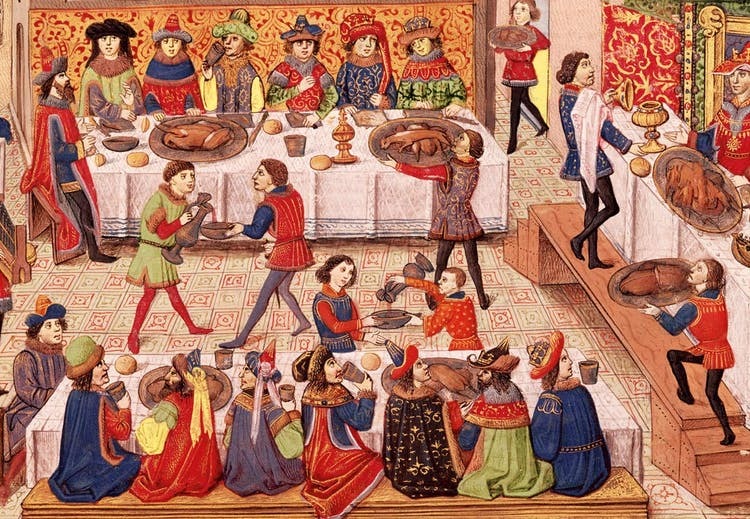 He was the owner of much estate in the country when he was convicted an outlaw together with his companions in 1287. His estate came to the Crown - and the estate at Djursland was established as Ranes Gods (Rane's estate) which existed up into the 16th century. After Rane Jonsen are mentioned several clerical and secular owners of Holbækgaard, but the names and ownerships are not clear. In 1340 it is said that Peder Munk "must have his farm in Holbæk given back" and in 1367 he is written of Holbækgaard. Still it is not sure if he was the owner. 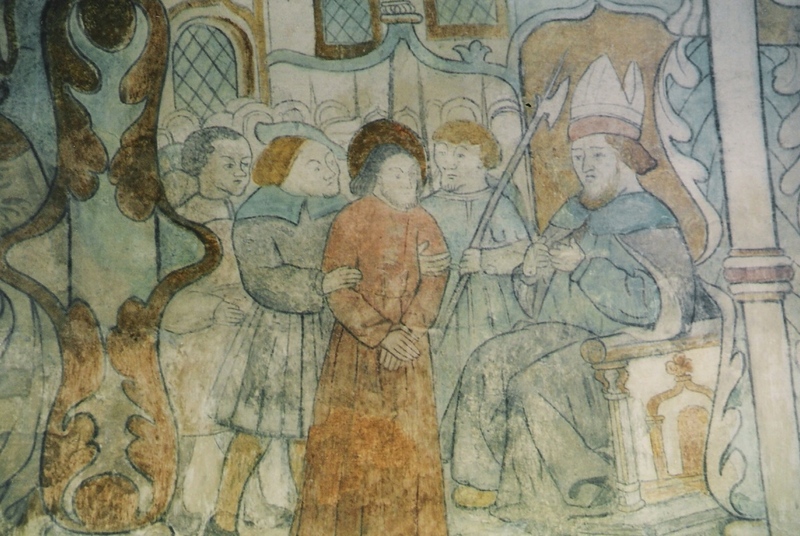 A long feud between the bishops in Aarhus and the family Munk did not end until Erik of Pommern had made judgment in 1408, where it should belong to the bishop in Aarhus. Peder Munk had possibly wrongly owned the farm or he was a vasal at Holbækgaard by bishop Svend who like himself was at odds with Grev Gert. 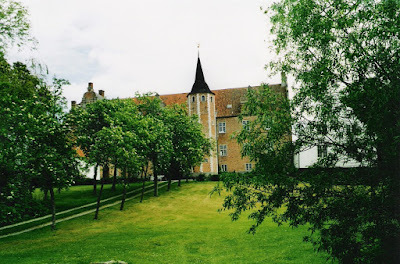 After the long feud which ended in 1408, the bishopric of Aarhus probably owned Holbækgaard manor and estate and Holbækgaard stayed in the ownership of the bishops until the reformation, where it was transferred to the Crown like other clerical estate. 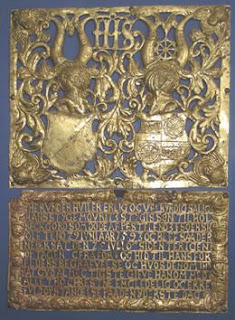 The last vasal Anders Jacobsen from a not wellknown noble family Hvittenstjern kept the vasalry but died shortly after and was followed by his widow, who in 1540 was succeeded by Hans Stygge who in 1544 bought it from the king. ouse only had few rooms. The second storey might have been a dance hall. According to the taste and conditions of that time Holbækgård was a genteel residence. Hans Stygge died in 1568. He was noted by firmness and honesty. After him came his son Mourids Stygge,who for a long time was High court judge in North Jutland. He increazsed the property exchanges with the king. He left some diary books where he mentions that he "kept house at Huolbeckgaard". In 1580 he was married to Anne Iversdatter Lykke in the hall. The family Stygge died out already in the middle of the 17th century. Fru Anne Lykke resided after her husband's death at Holbækgaard for some years. Three sons had died before their father and the fourth the son Peder was killed in 1613 in Sweden in the fight at Skellinge Hede. Shortly after this fru Anne Lykke sold Holbækgaard to hr. Albret Christensen Skeel of Fussingø. He died ab. 1623 in Randers, ca. 70 years of age . Albret Skeel was a coleric man, but a very able rigsråd and admiral. He was vasal at Riberhus from 1601, and he increased the estate of Holbækgaard. In 1630 he transferred it to his eldest son Christen, who lived here until 1633. Maybe it was for his children that Christen improved the stonehouse, since he extended it to the north and improved it in other ways. 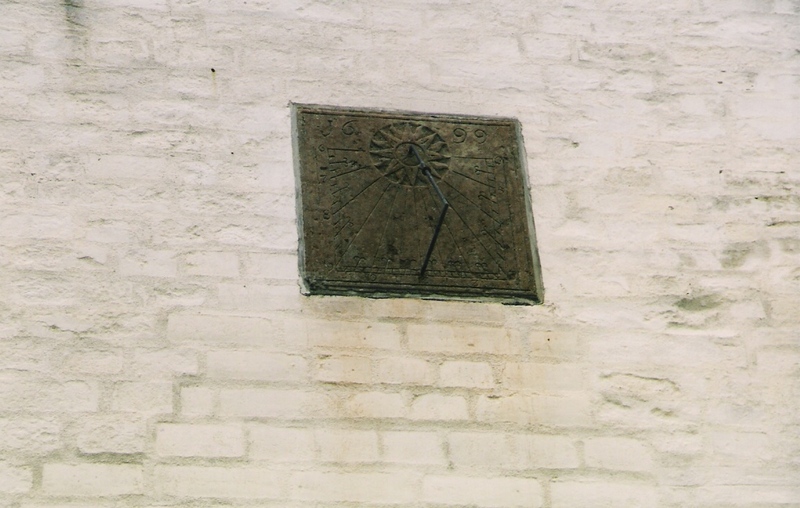 In the wall above the entrance of Holbækgård is a stone with the coat of arms of Christen Skeel and his first wife Birgitte Rud and the year 1645. Christen Skeel died in 1659 after having outlived his second wife Margrethe Jørgensdatter Lunge. He has been characterized as one of the finest Danish noblemen. He was both State Commissioner and rigsråd, and he was used in many public services like in some embarrassing negotiations with Karl Gustav. (Sweden) He was a very sympathetic personality . His leftover writings, esp. his diary give much good information. After his death his big estate was shared among his children. His daughter Berthe inherited Holbækgaard. It seems she also inherited the best qualities of her father's. She was married to Lieutenant General and Commander Niels Rosenkrantz of Skovgaard. They married 1661, but he died 14 years later - he was killed at the siege of Helsingborg. Berthe resided as a widow and owner of her father's manor until her death in 1720. Her husband had as a gift from Christen Skeel got Holbæk and Udby church with estate, and Berthe decorated those two churches where she was now the owner. 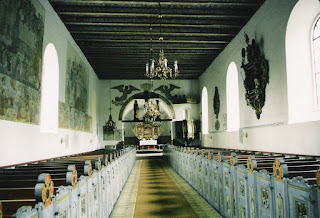 In Holbæk church she rised in 1682 a richly carved altarpiece etc. It was Berthe Skeel's wish to keep Holbækgaard for her family Skeel. She therefore established in 1700 manor and estate as a stamhus (entailed estate). Her own children died when they were little, but she brought up many aristocratic children. The entailed estate was meant for her orphant niece Charlotte Amalie who was the daughter of prefect Mogens Christensen Skeel of Fussingø. She later got royal grant to gather manor and estate under her own birk, which existed until 1852, to which the manor Stenalt also belonged (the manors had then a common owner). 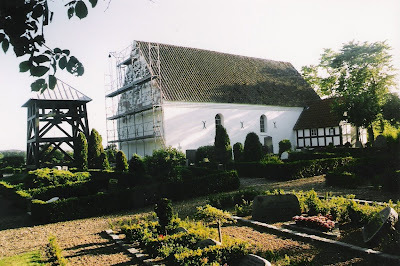 Brøns church, 15 km south of Ribe. The church in Brøns is literally one of Denmark's big churches, known as Denmark's largest village church. It is known for its fine Gothic inventory and the unique frescoes. The artist reproduced in his paintings his view of the decay of the Pope church in the 1530s. The 47 m long whitewashed building stands upon a profiled granite plinth. 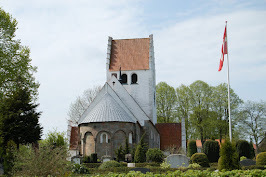 The church was in the Middle Ages consecrated to Sankt Villads and had a close connection to Ribe cathedral. Apse and choir are the earliest, Romanesque from the late 1100s, built in tufa stone. The nave (in tufa stone) was built in the beginning of the 1200s. The large windows are new, but four Romanesque windows can still be traced at the northside. In a window of the nave is a glass painting by J.T.Skovgaard. Choir and nave have a flat beamed ceiling. The apse is covered in a late Gothic rib vault. 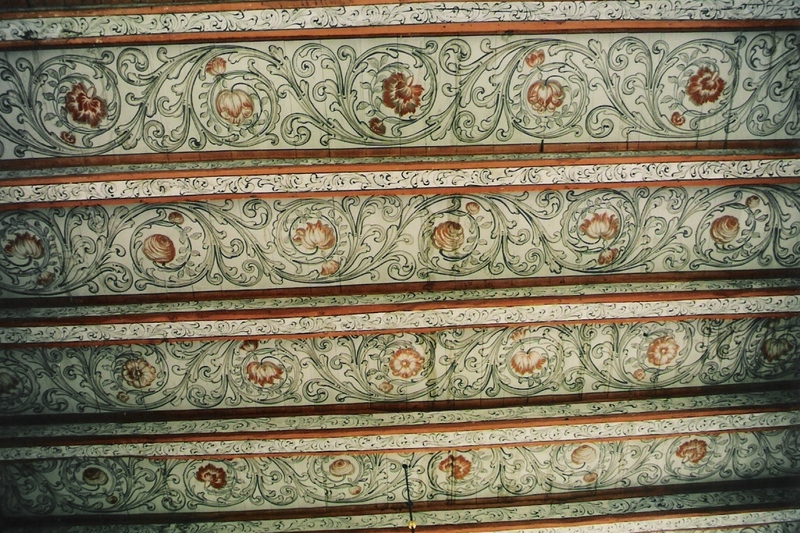 The beamed ceiling has acanthus decorations from the 1700s. Upon the northside of the choir is a closed priest-door, but all other original doors have disappeared. The late Gothic tower was built in monk bricks in the late 1400s. It rises 31 m tall with a typical spire (Tørninglen-type).The present entrance is via the tower room.Here are frescoe-rests in the vault and a Romanesque gravestone in granite with a relief cross. The little special ridge turret upon the choir is from the Renaissance period. All roof work is original and is signed with runes and the name Didrik. Late Renaissance altarpiece is probably carved by the Varde-master Jens Olufsen. The paintings in the fields are original. Upon the gallery 12 apostel figures from a late Gothic triptychon and an organ from 1699, later rebuilt. In the choir a monstrance-cupboard from ab. 1300s. The Romanesque granite font is somewhat scrapped in 1858, upon the basin are four male heads and diverse ornaments, upon the foot four corner heads. Above the font a sounding board from 1651. Upon a newer beam in the triumph arch a large crucifix group from the late 15th century. 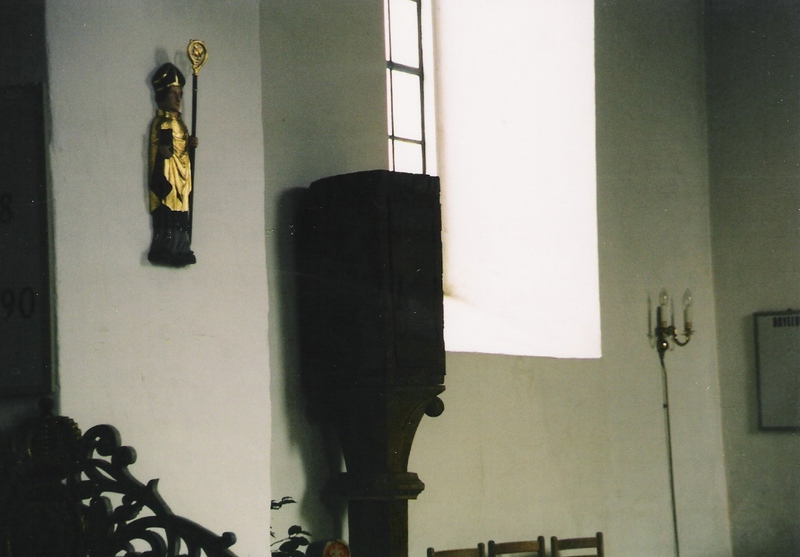 A simple Renaissance pulpit. Closed pews from 1730. A late medieval church coffin and an armored moneyblock from the 17th century. Two late Baroque style epitaphs. A Romanesque gravestone in the tower room and ab. 20 gravestones from the 16-18th century. The church was restored in 1961 by architect R. Graae. 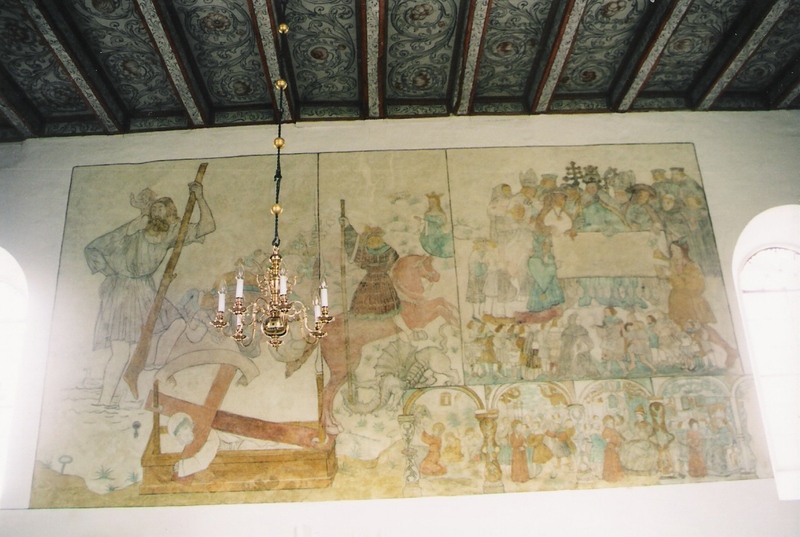 The frescoes in Brøns have a unique place among Danish frescoes. 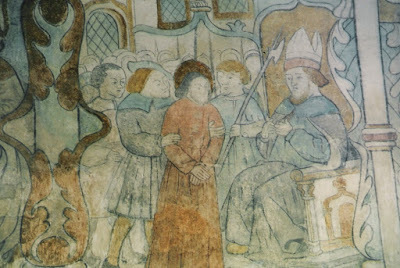 The frescoes upon the northern wall of the church are from the 1530, in the time of the reformation. The inspiration comes from Germany They are filled with clerical and secular figures dressed in colourful and draped robes from the 1500s. 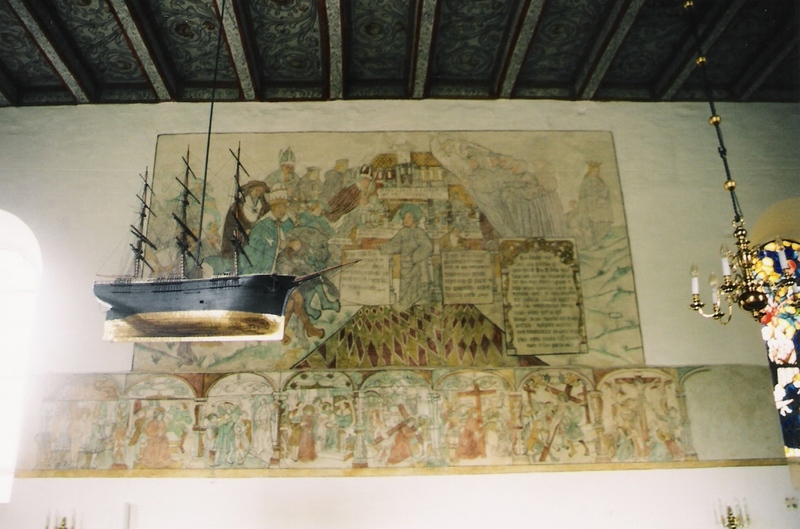 The frescoes in Brøns is a unique document from the time of the reformation . source: Danmarks kirker, Niels Peter Stilling, 2000. - Nordens kirker - Danmarks kirker. dk - wikipedia. Hjermitslevgaard is the easternest estate in Øster Hjermitslev village. Hjermitslevgaard was already in ab. year 1400 a noble farm which belonged to Niels Vognsen of a noble family with three blue male heads in their coat of arms. 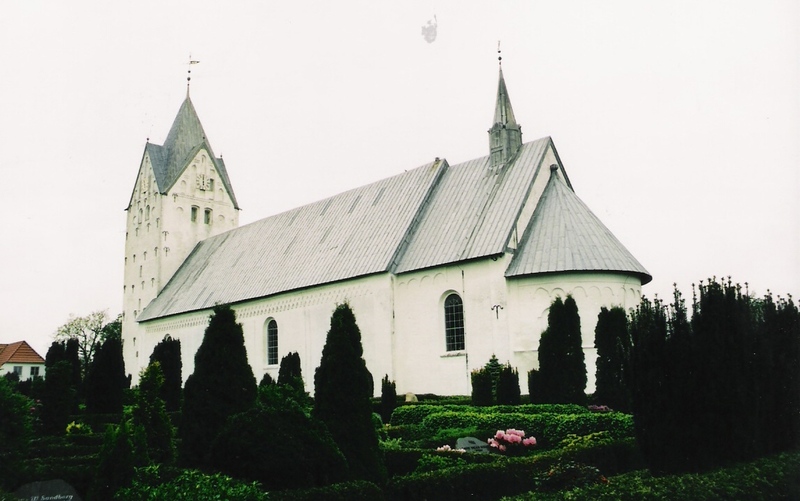 He and his wife Ingerd Hermansdatter Flemming Pennow, (who was widowed in 1425) gave a farm in Øster Hjermitslev to Tolstrup kirke. His son Morten Nielsen Vognsen became the owner after his father. He was written to Hjermitslevgaard in 1444. He had 6 children,who probably all had a part in the estate. Niels Mortensen was probably the first owner. He had a feud with Børglum kloster. Another owner, his brother Vogn Mortensen was in 1491 at the king's court to bring a case against Børglum kloster, but the kloster won. A sister Ingerd Mortensdatter - married to Niels Pedersen Skovgaard of Egebjerg - had also a part in Hjermitslevgaard, like another sister, Ide Mortensdatter - who was married to Thord Roed of Vaarst. Their daughter fru Maren Thordsdatter let "occupy" the estate for her and her children. Finally a brother to the first mentioned, Johan Mortensen Vognsen had a part in the estate, where he lived in 1481, it seems like he outbought his co-heirs. Bagges widow, Mette Mortensdatter married after 1537 Jens Thomesen Dan. He was probably from Albjerg in Torslev parish, and he was written of Hjermitslevgaard in 1568 and 1582. 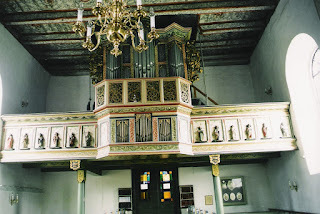 Jens and Mette gave the present altar candelabres to Tolstrup kirke, where they probably are buried. Mette had with Bagge Griis a daughter, Karen who died before 1568 and a son Morten Baggesen Griis who died young. 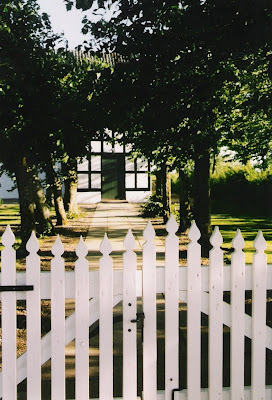 Fru Mette resided as an old lonely widow at Hjermitslevgaard, which she sold in 1587 to governor in Norway, Enevold Kruse who died 1621 as the owner of many estateas and manors. 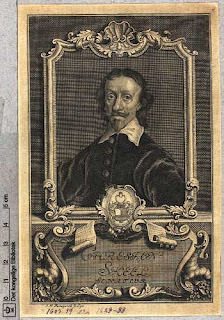 He was married to Else Jørgensdatter Marsvin who died in 1632. 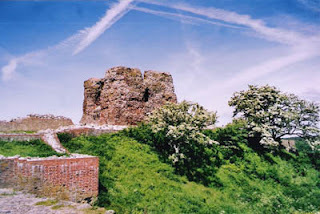 They probably built the bricked house to the west of the castle yard which still exists, and probably also two timbered houses in the castle yard with towers and spires and surrounded by moats. Enevold Kruse had 10 children. His son Jørgen Kruse inherited Hjermitslevgaard. He was born ab. 1597. During his ownership were three hostile attacks in Jutland which undoubtedly destroyed his economy -although the tradition says it was alchymi - which as known ruined his son-in-law Valdemar Daa. In 1668 Hjermitslevgaard was taken over by the Crown, the manor was sold and had various owners, in 1678 the wellknown witch hunter Jørgen Arenfelt of Rugaard. In 1988 Carl Felician Szabad, in 2000 Søren von Dosenrode. 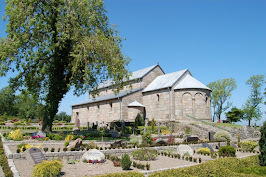 Tolstrup kirke was built between 1150-1200. Until year 1921 it belonged to Birkelse estate. In 1939 the church is mentioned as newly restored, probably after the new tower was built. The church has a Romanesque choir and nave and a late Gothic porch at the northside and the bottom part of a Gothic tower upon which was built a new tower in 1937. The Romanesque sections are in granite ashlars which on the southern side rests upon a plinth and on the nave with a profiled plinth. The choir had originally an apse and the walls are mostly rebuilt. Above the north door is a tympanum with a carved cross, while a similiar tympanum with a relief cross from the demolished south door stands upon the church yard west of the tower. The nave has a beamed ceiling, the choir a late Gothic eight divided vault.. In the choir was a window in the eastern gable, which outside is bricked up with granite a ashlars, but inside is marked in granite ashlars. The porch is in ashlars and monk bricks upon a profiled plinth. The upper section of the gable with glares and steps is new. The late Gothic tower was probably about 1770 demolished down to the height of the nave, and the church was without tower until 1937, when a new tower was built upon the old tower base. Triptycon altar piece createde by Svend Engelund from 1984. The altar piece from the late 1880s is in the chapel. Some late Gothic figures from a disappeared altar piece are now in the National Museum. 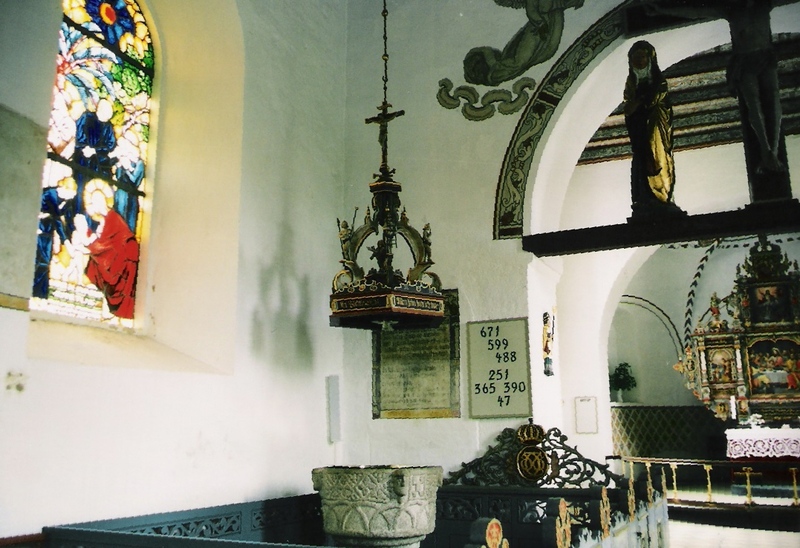 The chalice was given by Ove Skeel and Sophie Hedvig Rantzau, the baluster shaped ore candelabres were given by Jens Thomesen Dan and Mette Mortensdatter Vognsen, Hjermitslevgaard. The simple Romanesque granite font upon a circular foot stands in the western part of the nave. The pulpit is a good joinery in Renaissance from 1612 with a contemporary sounding board. A late Gothic crucifix. The church bell without signature is from late Gothic period about 1450-1500. Below the choir is a closed burial vault for the owners of Hjermitslevgaard. In the choir a figure stone for jomfru Anne Mortensdatter Vognsen and for manager at Hjermitslevgaard, Christen Christensen Solholdt. Epitafs for manager Peder Thomsen Kiærulf and wife and for parish priest Niels Ifversen and Jens Jessen. Before 1970: Asdal, Asdal sogn, Vennebjerg herred, Hjørring Amt. The first owner of Asdal is from the 1300s, hr Niels Ovesen of the nobility - which by the genealogs from their family coat of arms named Panter. Niels Ovesen Panter and his wife fru Johanne Andersdatter (Stenbrikke) owned the manor - but besides Asdal Niels Ovesen was the owner of much estate in this region, like Skovgaard and Kærsgaard in Vennebjerg herred and Knivholt in Horns herred. He was a wealthy and respected man, he was a knight and had two of his children married into the zealand nobility family Lunge. The daughter Ingeborg, ( widow after 1429), married ca. 1390 the later rigsråd and hofmester Anders Jacobsen Lunge. Asdal was inherited by Niels and Johanne's son væbner Anders Nielsen Panter, who in 1393 wrote himself of Asdal and was married 1) to Regitze Jacobsdatter Lunge , who died soon after. Anders died 1405 or 1406 but he had before this married Ide Lydersdatter Holck (+ earliest 1425) , who in 1406 owned Asdal and later married hr Lyder Kabel of Fuglsang (+ earliest 1440), who in 1415 wrote himself of Asdal. 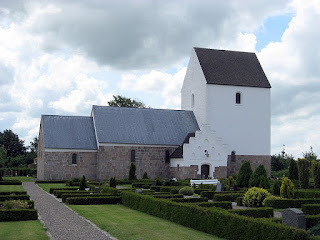 Lyder Kabel and Bonde Due of Torup (Hillerslev herred) on behalf of his wife achieved in 1419 by a share of inheritance 2/3 of Asdal, while 1/3 of the manor went to Anders Nielsen Panter's sister fru Ingeborg Nielsdatter Panter's (+ earliest 1411) husband , rigshofmester hr. Anders Jacobsen Lunge (+ 1429). Asdal, foto Den store Danske. Bonde Due (+ earliest 1430) was married to fru Ide's daughter * fru Johanne Andersdatter Panter (+ 1477) and took over in 1419 hr. Lyder's part in Asdal; fru Johanne , who was said to be the last member of her family (Panter), was in 1462-63 royal vasal in Vendsyssel; her second husband was hr. Niels Eriksen Banner of Vinstrup (+ earliest 1444), who in 1425-43 is written of Asdal. A relative of Niels, hr. Jens Eriksen Banner( + earliest 1444) must also have had a share of Asdal, which he wrote himself of in 1423. 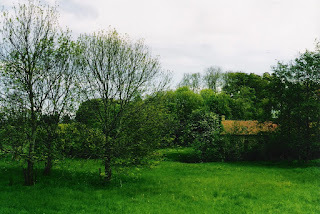 After the death of Niels Eriksen Banner fru Johanne wrote herself in 1455-74 of the manor; in the division of the estate after her Asdal estate was laid out to her son rigsråd hr. Anders Nielsen Banner, who already in 1454 and 1463 had written himself of Asdal. At his death in 1486 his only son Erik Andersen Banner, who in 1480 wrote himself of Asdal, had died a few years before (+ latest 1483) , but his widow Karen Stensdatter Gøye is mentioned in 1480-88 of Asdal; she later married rigsråd hr. Niels Høg Banner of Eskær (+ 1524). * fru Johanne Andersdatter Panter, who died in 1477 the last of her family, achieved great wealth from inheritance - and in the nobility family books is told that she was a member of rigsrådet. This is said to be a legend, but she was in 1462-63 royal vasal in Vendsyssel. It was said that her family rejected Bonde Due's proposal to her, but he abducted her and they were married. When in 1419 was a legal change after old Niels Ovesen, Bonde Due was present for his wife and Anders Jacobsen Lunge for his wife as heirs. Both achieved parts in Asdal, but since fru Johanne before 1422 married again, this time to hr Niels Eriksen Banner, Asdal came into the ownership of this family and stayed there for almost 200 years as one of the main houses of the family Banner. Niels Eriksen Banner was from Zealand, his father owned Vinstrup and Niels inherited also this manor. He was in 1438 rigsråd and vasal at Skivehus, later vasal at Aalborghus. He lived still in 1444, took part in devoting Erik of Pommern and in calling for Christoffer of Bayern. His son, Anders Nielsen Banner, achieved even more respect for the family, he became ridder and rigsråd and was like his father royal vasal at Aalborghus, and this vasalry was later owned by his son and son's son. 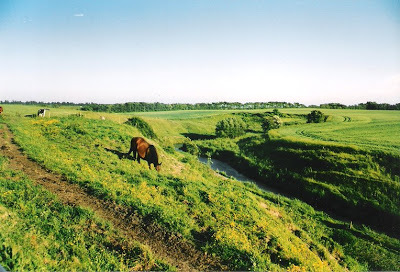 The strong attraction to this North Jutland vasalry is linked to that Anders Nielsen and his descendants became 100 % Jutland lords and were among the richest. Anders Nielsen owned besides Asdal, Kokkedal and Højriis 2 smaller Jutland manors plus the zealand manor Vinstrup. It is a proof of his good reputation that he in 1486 during king Hans's stay in Norway was among three leaders of the government in Jutland - he died the same year. His only son Erik Andersen Banner had died a few years before, but his widow Karen Gjøe wrote herself in 1480-88 of Asdal. With their son Erik Eriksen Banner the family came up in the top plan of society. Erik Eriksen Banner was a vasal at Kalø and kept it in 40 years till his death in 1554. He was exposed to a costy accident since Gustav Vasa who was a prisoner at Kalø escaped him in 1519. Christiern II sentenced Erik Eriksen to a fine of 1.600 gylden,a giant sum of money. There was however no animosity between the king and his vasal, and Erik Eriksen did not take part in the rebellion against the king, but when he was directly and personally threatened, he joined Frederik I. His good reputation was not hurt by having joined the displaced king for so long - he now became a rigsråd. It was strange that he was one of few noblemen who was in favor of the new religious movement in Denmark, he let a Luther-minded priest call to Thorsager kirke which was Kalø's parish church . When Frederik I died, Erik Eriksen was in favor of hertug Christian to become Danish king, and when the Skipper Clement feud broke out he was firmly against it. When the revolt was crushed at Aalborg, Erik Eriksen Banner was together with Johan Rantzau commander of hertug Christian's troops. His quiet performance of various administrative jobs in the rebellious districts contributed to calm the mood of people. * It was said that Erik Eriksen Banner helped Gustav Vasa to escape, and if this is true then Sweden has got something to thank Erik Eriksen Banner for. After Christian III was elected king, Erik Banner's succes was safe. 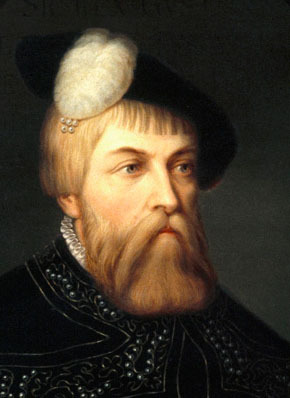 He was connected to the king and achieved in 1541 the title of rigsmarsk and he was attending several of Christian III's travels, like the the meeting at Brømsebro with Gustav Vasa. It must have been strange for Erik Banner to stand face to face with the man who had once been his prisoner. In his latest years Erik Banner wrote himself most often of Asdal, his son Frands seems to have taken over Kokkedal while his father lived. Erik Banner died in 1554, ca. 70 years of age at Kalø, which more than anything else had formed a frame around his life. He was buried in Torslev kirke, the parish church of Kokkedal. It was said about Erik Banner that he was one of the most important and influental noblemen in the reformation period in Denmark, but none of his children inherited his abilities. His estate was shared among his heirs, and Asdal with Bangsbo came to his son Otte, who from 1560 was a vasal of Sejlstrup, he was mostly known for his marriage to Ingeborg Skeel of Voergaard. She kept the vasalry after her husband's death 1585. Fru Ingeborg Skeel was more than anyone else a personality in the legends from Vendsyssel, not because of her virtues - often usual legends from other places (called vandresagn = wandering legends) who were localised to Voergaard (and never to Asdal) where she had the main role in the legends. Her authority must have been stronger than that of other noble ladies, like her economic sense and energy .She had a fine cattle herd at Voergaard, she traded in grain and bricks and she let her people be merchants and trade on markets etc. She kept her churches in good condition and she had in general a good relation with the Clergy. Otte Banner and fru Ingeborg had no children. Otte Banner wished to give Asdal to his brother Anders Banner's sons with Dorthe Rud, but he claimed that the king had to make the gift unshakeable. The king accepted this, but it was however Otte's sister Karen who after Ingeborg Skeels death in 1604 and after long and complicated judicial feuds became the owner of Asdal. Karen Banner died in 1611, and Asdal had a troubled destiny in the next years. Several aristocrats had part in it. Above mentioned Anders Nielsen Banner's daughter Anne Andersdatter Banner (+ latest 1490) , who was married to Jens Due Thott of Egholm (Voldborg herred) had inherited a sister-part in A., which she according to a thing's witness in 1492 gave to her brother's children. Among these rigsråd and rigsmarsk Erik Eriksen Banner (+ 1554) inherited Asdal manor and estate, which later came to his son Otte Eriksen Banner, married in 1560 to Ingeborg Skeel of Voergård, who after his death in 1585 kept Asdal until her death in 1604, since Otte Banner before his death had conveyed manor and estate to his family, but in a way so fru Ingeborg kept the estate or a part of it as fief for the rest of her life. Two brother-sons, Erik Andersen Banner of Gjessingholm (+ 1597) and Otte Andersen Banner of Studstrup (Rinds herred) (+ 1625), inherited Asdal, to which the first mentioned wrote himself in 1595, while Otte Banner's sisters Berete Banner (+ 1592), married to Knud Bille of Lindved (+ 1592), Magdalene Banner (+ 1597), widow after Iver Krabbe of Krabbesholm (+ 1561), and Karen Banner of Høgholt, widow after Gregers Trudsen Ulfstand of Gl. Estrup etc. (+ 1582), achieved a part of the spread estate. Later owners of Asdal: the families Ulfstand, Podebusk, Rantzau, Skeel, etc. The owner in 1935 and still in 1959 was Jens Andreasen from Guldager (Vrejlev sogn). And else various owners up til present. In a glass box above the main entrance of Asdal Hovedgaard are the rests of a very old ham-bone from a pig. The ham-bone is said to be over 400 years old - and caused by its durability and strength it has supernatural powers, which will be transferred to the house where it is kept. If the ham is removed strange things will happen at Asdal. Some hundred years ago the pigs eat mast in the beech- and oak woods. The lands of Asdal Hovedgård and Odden were adjacent. In the hunting a pig was shot and the owners of Asdal Hovedgård and Odden disagreed about to whom the pig belonged. The disputes lead to a lawsuit and the outcome was that the owners of Asdal and Odden had to divide the pig lengthwise. The bacon-sides had to be hang up on the wall in the two manors - and he who was able to keep the ham fresh for the longest period was the true owner of the pig. The ham is still at Asdal, but it has disappeared at Odden. Next to the farm buildings of Asdal Hovedgård is the large Asdal Voldsted, which consists of a square about 11 m high castle bank ( 63 x 37 m) surrounded by moats, still partly water-filled. The access to the castle bank was from the south, probably via a bridge. At the castle bank was a three-winged building complex, there are still rests of buildings at the top. 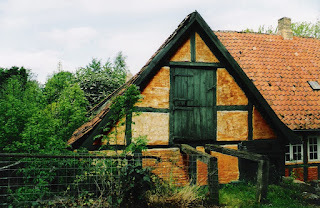 In 1662 were two houses in two storeys and one half-timbered house in one storey. 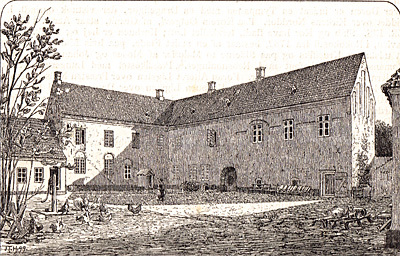 In 1769 the castle yard had two houses, one two storey, the other three storey high, one of these houses (named Brunhuset) was said to have been one storey higher. According to tradition there were two huge towers( Vagttårnet and Brandtårnet) on the northern wing's two sides, the rests of these were said to be gunned down in the war 1807-14. Brickworks have been found. The small white-washed church is situated in a desolate place southeast of Asdal Hovedgård (manor). 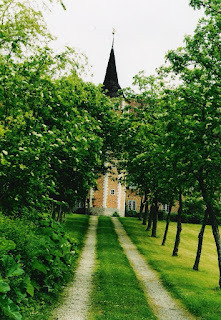 Asdal church was from the beginning only a chapel for Asdal manor. The parish was earlier named "Asdal Kapels sogn" and Niels Persøn is mentioned in 1476 as a curate at Asdal. The church is a late Gothic longhouse building from the last half of the 1400s with a half-timbered porch to the north, probably from the 1700s. The Gothic building is built in monk bricks mixed with a few granite stones. In the north wall inside is a broad point arched glare, possibly a bricked-up archade for a later broken down sacristy or burial vault. The ceiling in the undivided room is dressed in boards. The little pretty porch has black tarred half-timbering. 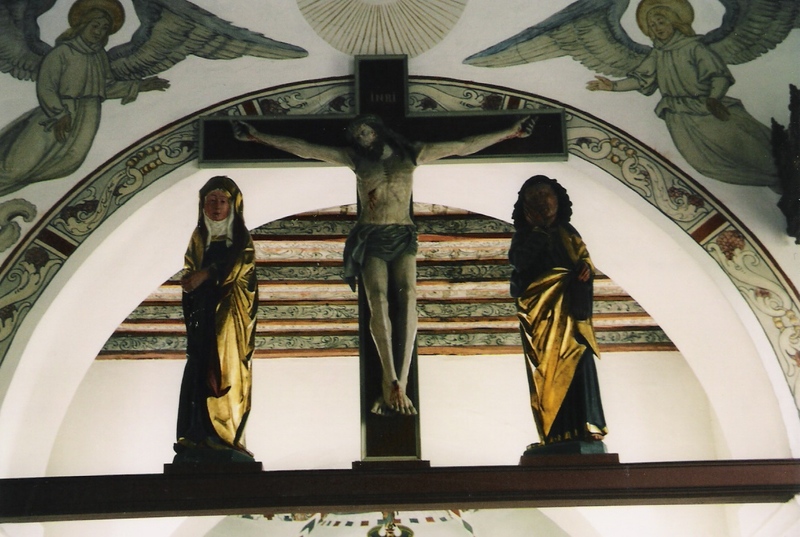 Some figures from an earlier late Gothic altar piece and a crucifix-group is given to the National Museum in Copenhagen. The altar piece is a Lutheranian triptychon from ab. 1575 with a painting from ab. 1700. A chalice from the 1700s. Late Gothic ore-candelabres from ab. 1550 with the coat of arms of Banner. A late which probably belonged to the church was found at Asdal Voldsted (castle bank). It is now at the National Museum. A Romanesque granite font with a hemispherical basin and a truncated crone-foot with line ornaments. A south German baptismal bowl, ab. 1575. The pulpit is a fine Renaissance joinery from 1578, given by Otto Banner of Asdal and wife Inge(Ingeborg) Skeel with their paternal and maternal coat of arms, restored in 1905. 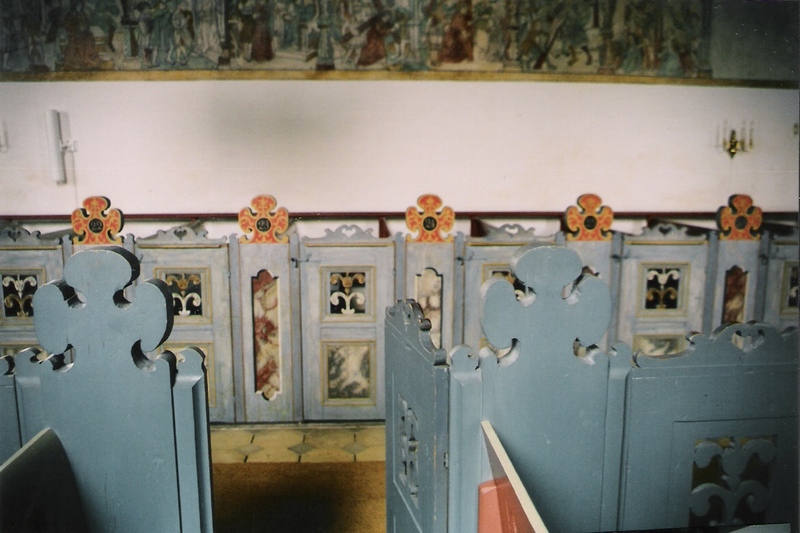 Pews from the same period and manor-pews with the same coat of arms. A church bell from 1627 cast by Hans Kemmer with Fr. Rantzau's name. In the choir a marble epitaph for Christen Speitzer Follerup, +1789. 5 gravestones from the 1600s and 1700s, one is a trapez-shaped bondegravsten (peasant) in granit for ("wife MGD died 1800"). Listed prehistorics: 3 hills, i.e. the high placed Hellehøj; one is possibly the rest of a stone grave. Demolished or destroyed: 13 hills, all in the southern hilly part of the parish. At Rugtved is found a burial site with stone graves from early Roman Iron Age, and upon the low terrain close to the border of Uggerby was found a settlement with fields from Celtic Iron Age. From Stejlbjerg is a finding with 3 guldbrakteater (gold plates) and 18 glass pearls. (1662 Steilberig); Rugtved (1688 Routued); Hulskov ( 662 Halschou, 1688 Houl Schouf); Rynken (1688 Røncken ) ; Gravholt (1688 Graufverholtz Huus.). Odden, Region Nordjylland, Mygdal sogn Vennebjerg herred, Hjørring Kommune. before 1970: Mygdal sogn, Vennebjerg herred, Hjørring amt. The family Lunge were the owners of Odden for about 300 years. 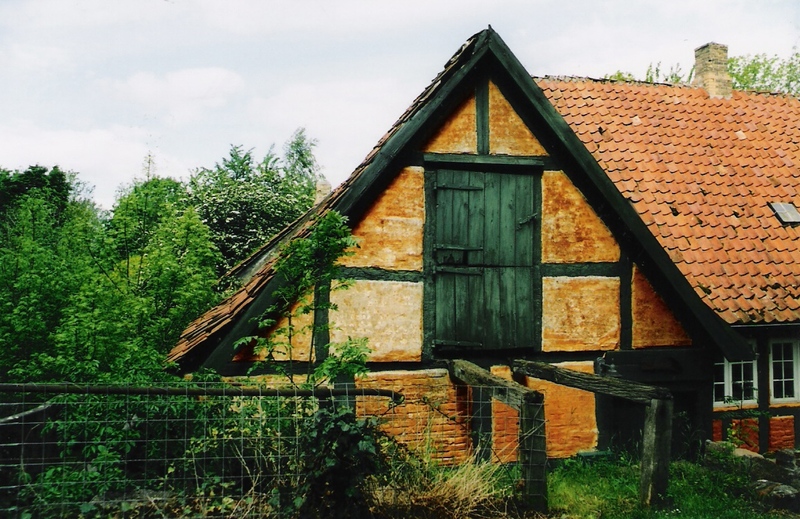 No owner of Odden is with certainty known until into the 15th century, where it belonged to the ancient family Lunge. 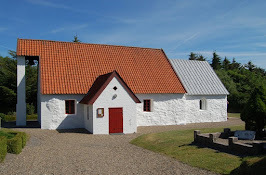 Through marriage and inheritance this sjællandske ( zealand) family had resided in the northernest regions of Jutland. Hr. Anders Jacobsen Lunge, one of the richest and most respected noblemen in Denmark, a rigshofmester and a member of the rigsråd, married in his youth hr. Peder Offesen Neb's widow fru Ingeborg Nielsdatter Panter, and with her he got considerable estate. A few years after her death was in 1419 legal change after his parents-in-law, hr. Niels Ovesen Panter and fru Johanne - and much estate came to Anders from the region around Hjørring, like Knivholt and Bøgsted, the manor Odden was probably mentioned too. Hr. Anders Jacobsen Lunge had no heirs, a son of his cousin hr Oluf Andersen Lunge wrote himself of Odden in 1454. Hr. Oluf was one of his time's most excellent noblemen. He was the first known owner of Odden. He still lived in 1473. Odden came after his death to his son Oluf Olufsen Lunge who died in the 1470s, he was the last male of his family. 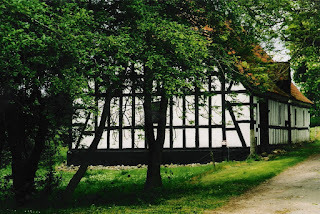 His widow Karen Nielsdatter Banner brought Odden to her second husband Vil Thomasen Galskyt, who in 1479 and later wrote himself of the manor Odden, but Oluf Lunge's son-in-law Henrik Friis of Haraldskær (+ earliest 1500) was partly owner of Odden and later without doubt sole owner. After his first wife fru Anne Olufsdatter Lunge (with whom he had several children) died, he lived in a probably childless marriage with Margrethe Mogensdatter Krabbe of Bøgsted who outlived him with many years. The death year of both is not known. 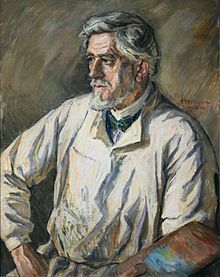 The next owner Ove Vincentsen Lunge, who got the manor Odden via marriage to Anne Henriksdatter Friis (his first wife was Karen Eriksdatter Rosenkrantz +) played an important role among his contemporaries. His father was of the family Dyre, his mother of the family Lunge which earlier owned Odden, and he and his siblings took names after her. After king Hans's death he was soon a warrior, soon a diplomat, he was a member of rigsrådet, he achieved the knighthood and had important vasalries. He inherited Tirsbæk after his father, he got Odden with his second wife Anne Henriksdatter Friis and he bought Kragerup at Zealand, he had success as a farmer and he was a bibliophile too. He died in 1540, his wife, Anne Henriksdatter Friis, whose first marriage was to Bjørn Andersen Bjørn of Stenalt, outlived him with a couple of years. After Anne's death came Odden in 1542 to the son Tyge Lunge (Dyre) (+1545)(whose widow Sophie Nielsdatter Kaas (Sparre-K.) disclaimed liabilities on succeeding to property), and to Christoffer Lunge (Dyre), (who was killed in 1565 in the battle of Svarterå). 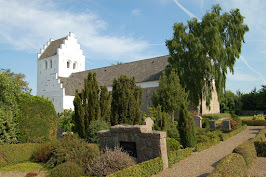 He and his wife fru Karen Jørgensdatter Juel were buried in the chapel at Mygdal kirke. 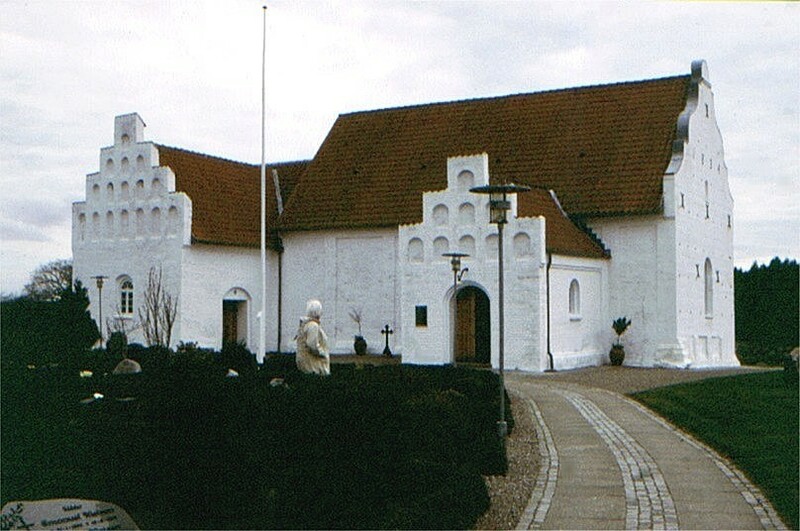 Odden went to his son Ove Christoffersen Lunge (Dyre), whose wedding to Anne Maltesdatter Sehested was held at Odden. Ove Lunge died in 1601, and after his death Odden went to the son rigsmarsk hr. Jørgen Lunge (Dyre) of Birkelse etc. ; he took part in the Kalmar war, had several vasalries and was from 1616 member of rigsrådet, he was rigsmarsk and ridder, he died already in 1619, only 41 years of age - and was like his parents buried in Vor Frue kirke in Aalborg. 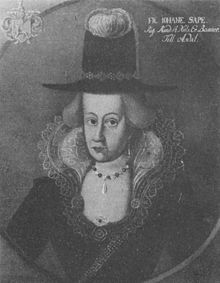 His wife Sophie Stensdatter Brahe retained Odden for the time being, she outlived her husband with 40 years and saw almost all her children die in their best years of life, seven married daughters and the son Ove, the last male of the family, died before her, only the daughter Ide outlived her. Fru Sophie had in 1656 refrained Odden, Birkelse and Høgholt to her children and children-in-law. Høgholt came via the daughter Lisbet to the family Rosenkrantz, Birkelse came to a branch of the family Skeel and Odden was shared between the late Anne Lunge's son, Just Justesen Høg and Otte Skeel's widow, Ide Lunge, who swapped away her halfpart to her sister's son Mogens Christensen Skeel, who became the sole owner of Odden by in 1661 buying Just Høg's part. After him came Odden to the son Ove Lunge, who died unmarried in 1637, the last male of his family. His mother Sophie Stensdater Brahe ( + 1659) took over manor and estate. And this was the end of the Lunge era at Odden. he word Odden means an isthmus, a spit of land - the manor was built upon a spit of land, on the northernest spit of a low hillside or an isthmus, which grew out from a meadow surrounded on both sides by brooks which went together and formed a small lake, where the water was used for the mill. The main building is one of the district's most interesting secular buildings, but its history is not fully known. The manor has three wings of which the built-together south and east wings are from the first half of the 1500s, while the low west wing in half-timbering is built ab. 1765. The oldest part is probably the east wing, with Ove Vincentsen Lunge as the building master. The white-washed wing has a red tiled roof. 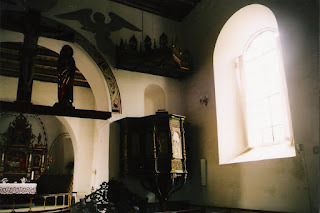 Remarkable is the great blændingskors (cross) upon the southern gable, a so-called patriark-cross placed between the two upper windows of the gable. The cross is the distinctive mark of the family Lunge and it shows that the east wing must be built in the Catholic period. The south wing with a gate-passage was probably built by Christoffer Lunge in the 1540s. Much later probably after a fire in 1763 is the present west wing which was built in half-timbering in one storey. Odden might have looked rather sinister in its first time with the dark, heavy buildings without towers or spires and its small windows placed rather randomly. It was known as one of the oldest farms in all of Jutland, no older neighbouring moat sugessts, that it earlier was placed otherwise. Now the more than 400 years old buildings are whitewashed and lights up the landscape. The land of the manor was outparcelled in 1945-46. Today Odden is used for exhibitions based upon a large collection of the Danish artist J.F.Willumsen's works. 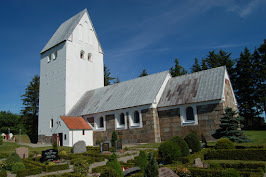 Mygdal church., built about 1300. The rather desolate placed white-washed church in Mygdal has a late Romanesque choir and nave, a chapel by the north side of the choir from ab. 1550-60 and a porch from 1897. The late Romanesque building is mainly in bricks and is closely related to the Vendsyssel brick-work group. Both gables are re-walled. The choir arch inside is extended and both choir and nave have beamed ceilings. 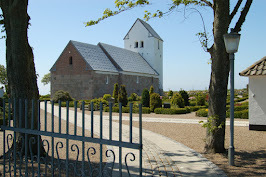 The large chapel at the northside of the choir was probably built by Christoffer Lunge as a burial chapel. Interior: A walled communion table in monk bricks. 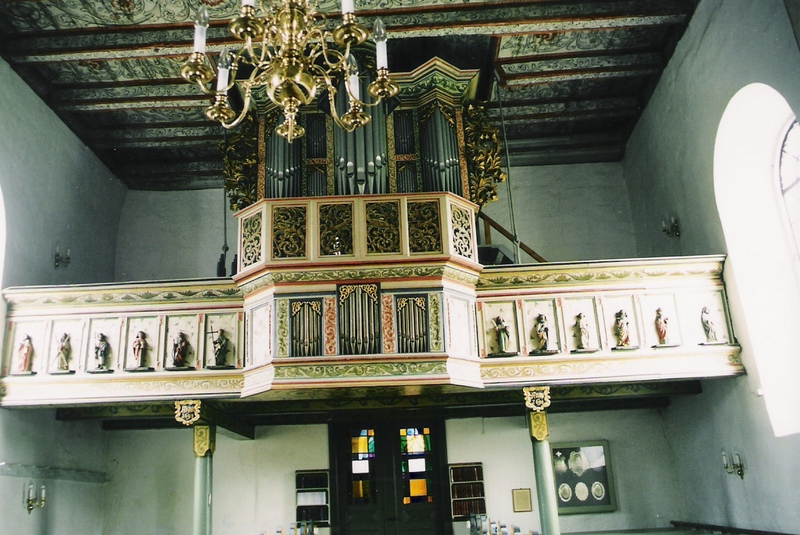 The altar piece has sections from Renaissance with the coat of arms of Ove Lunge and Anne Sehested upon the foot piece; it was re-made in Rococo in 1777 with the names of Pors Munch and Else Joh. Seidelin and a new painting. Chalice from 1761. Late Gothic ore candelabres. A small gilt alabast crucifix is now in the National Museum. A Romanesque granite font, half-circular basin upon a hollow pyramid-foot. A south German bowl from ab. 1575 with engraved coat of arms of Kaspar Markdaner and Sofie Oldeland. A late Gothic choir arch crucifix from ab. 1500 upon a new wooden cross. Upon the north wall a pretty fresco of Maria with child from the late 1300s probably by the same painter who made Skt Kristoffer in Hjørring. Below Maria a coat of arms with chess-pattern, probably for Niels Mogensen Glob who was know in this region in 1394. 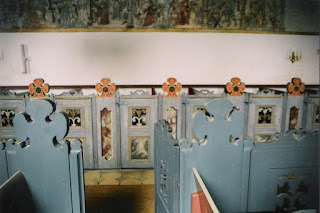 A pulpit in simple Baroque with painted year 1777, repaired 1932. 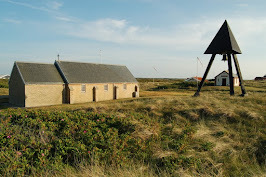 The church bell with the name "Rose" was cast in 1560 by Peder Lauridsen for Christoffer Lunge and hangs in a bell frame. In the choir wall a magnificent Renaissance grave stone from 1576 for Christoffer Lunge, who was killed in 1565 at Falkenberg and Karen Jørgensdatter( Juel) + 1556, with portrait figures of both. 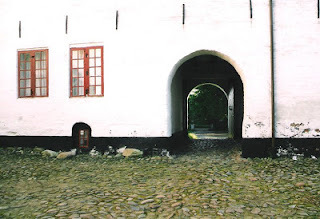 Harridslevgaard slot is mentioned the first time in 1231, where it belonged to the king." Haræslef" is mentioned in King Valdemars jordebog of 1232 as one of the king's castles. It had then a value of 144 mark gold. 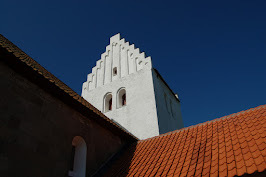 In the early Middle Ages "Haræslef " was according to the legend a sørøverborg (pirate's castle) . 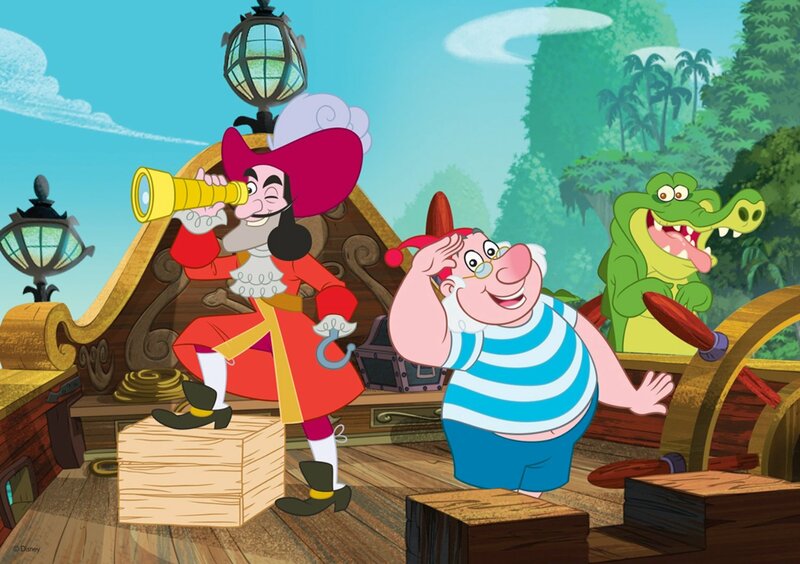 At that time the sea went right up to the castle with a free view across the sea and the pirates hang out lamps to fool the ships to come close to the coast, where they could enter the ships and rob everything they wished for. But there were so many complaints about the pirates at Harritslevgaard that the king took action and had them all executed. In 1542 Jørgen Svave got a livbrev of the manor (royal guarantee for ownership for life) and he succeeded in buying it as a free estate in 1560, where the document says that it was sold to the king's vasal Jørgen Svave by Frederic 2. Rigsråd Breide Rantzau (1556-1618) bought the old royal administration-center Harridslevgaard in 1589 from Jørgen Svave. The deal went possibly on under shady shapes. The Svave family led process about the sale still ten years after the sale. Breide however did not care. The spirited aristocrat was one of the young Chr. 4's loyal followers and also a good svirebroder ("feasting brother"). It was always a great feast when Breide accompanied the young king on his travels to Norway and England around year 1600. 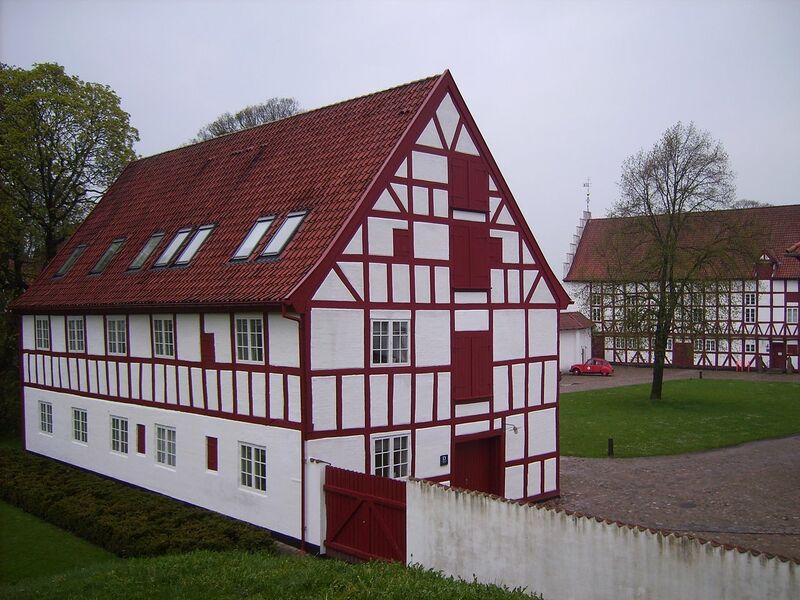 Breide Rantzau belonged to the wealthy and powerful Rantzau-family who came to Denmark in connection to Grevens fejde in 1533-36, where Breide Rantzau's grandfather Johan Rantzau was Chr. 3's army chief. 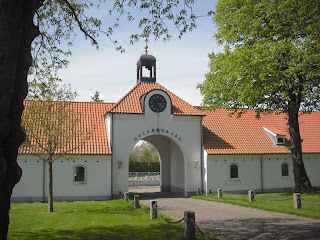 The family was - especially at Funen - rewarded for its loyalty to the king with several manors like Rantzausholm (Brahetrolleborg), Hellerup, Hindemae and Harridslevgaard. Breide Rantzau broke down the old castle and built a new Renaissance building which was finished in 1606,in three storeys and with a large octagonal stair tower by the castle yard. Breide's daughter-in-law, the beautiful fru Anne Lykke received her royal lover, Chr. 4's eldest son (the chosen Prince) on Harridslevgaard, while she was the owner in 1623-31. 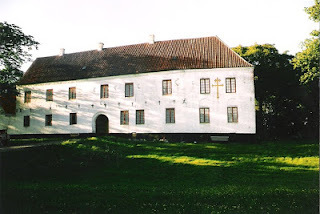 Anne Lykke lived in 1623 at Harritslevgaard after her husband Kaj Rantzau's early death and the rich widow cast her pretty eyes on the Crown Prince, the young Christian, while his father Chr. 4 without luck took part in the 30-years' war in North Germany. At his homecoming after the painful defeat at Lutter am Barenberg Chr. 4 let in 1626 Anne Lykke arrest and put in prison at Kronborg. The acussation was that she by "druk og letfærdighed" (drinking and frivolity) had disturbed the Crown Prince in his leadership of the government in the absence of Chr. 4. After in vain having tried to start a case against Anne Lykke the king had in 1628 to set her free, if she would promise to stay at her manor. 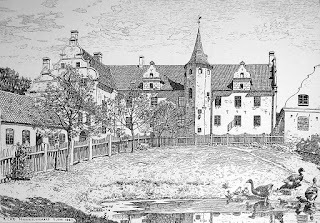 On her release in 1628 she settled at the manor Hellerup at east Funen, while her other estates were left to members of the Ulfeldt and Rantzau family. She married in 1629 one of Jacob Ulfeldt's many sons, the learned Knud Ulfeldt. Anne Lykke died in 1641. After her came several owners to Harridslev, until the castle in 1829 was sold to greve Bernstorff-Gyldensteen. The big adjoining land still belongs to Gyldensteen, while the main building was sold to other side. The owner Christiane Hoppe Hagedorn expands in ab. 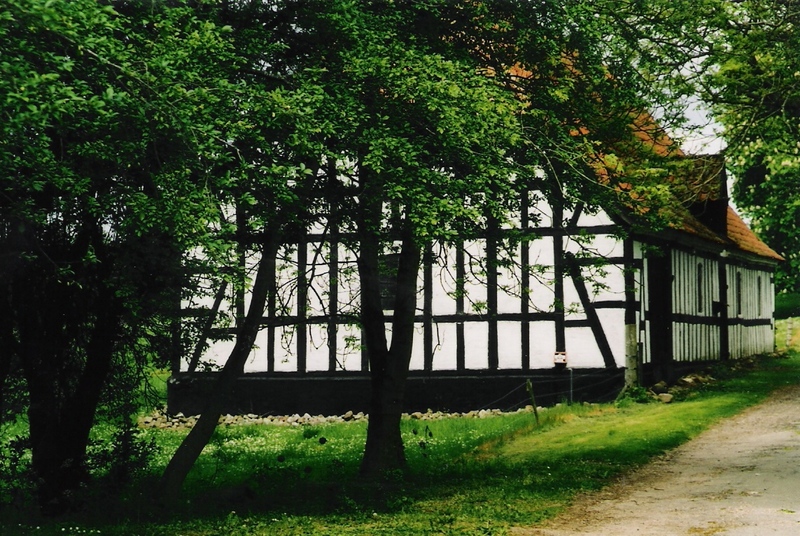 1750 the adjoining land, rebuilds the main building (1753) and establishes a stutteri. She was a diligent lady of the castle and she now haunts the castle as the white lady. Harridslevgaard came after the introduction of the absolutism in 1660 soon in bourgeois hands and changed owners up till 1829 where grev Bernstorff at Gyldensteen bought the castle, and it was combined with the neighbouring estate Gyldensteen northeast of Bogense. 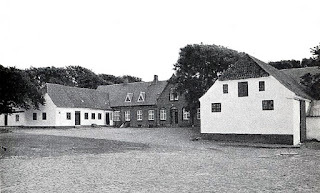 1922 At the county's transition to a free estate was sold 800 tønder land from Harritslevgaard's earlier adjoining land for the founding of 66 smallholdings. 1963 Director/Antique dealer Frank Nicolaisen buys Harridslevgaard with park, but without farming from grev Carl Johan Bernstorff of Gyldensteen. While Frank Nicolaisen was the owner he started from 1963 a thorough restoration. The family Schimko bought Harridslevgaard in 1985 and continued the restoration. In 1995 they opened the castle to the public. Only a little is left from the original manor except the sandstone fireplaces and the room divisions. In the reconstructed manor environment you can walk from the Pigekammer (servantmaid's chamber) in the basement and the large kitchen and via beautiful rooms and living rooms up to the magnificent riddersal (Knights Hall), which fills out the whole upper storey of the east wing. The present pretty and right inventory are new antiquities, bought with a sense of a castle's historic inventory. The knights hall of 400 kvm is the largest privately owne in Denmark and is very imposing. From the Knights Hall is access to two hemmeligheder ( medieval toilets in the wall). In the north wing is "the blue room" with marbled, handcarved panels in an exceptionel blue room - and the modern hemmelighed is also in blue. The Winter Hall in the east wing with its original richly ornamented sandstone fireplace is remarkable. In the north wing is also "the red living room" with a well preserved vaulted ceiling and pretty red wallpapers. In the basement are among others two rooms called "jagtstuen" (hunting room) and "badstuen" (bath room). Here was originally laundry and bakery . It is now furnished into an exclusive bathroom and hall. In the medieval cellar is a vaulted kitchen which still 400 years later is serving its original purpose. From the kitchen is a downturn to a socalled dungeon, which probably was the old cold storage and wine cellar. At the kitchen wall are the traces of a spiral staircase, which connected the kitchen to "the red room" above. Harridslevgaard has - together with other mysterious happenings on Funen - made the background of a book "Guide til det okkulte Danmark" by the author Bo B. Hamilton-Wittendorff. Peculiar occassions sometimes happens.A visiting woman was scared to death by a little girl who had been chasing her, until she suddenly disappeared out in the blue. The woman described the little blonde girl, dressed in something which looked like an oldfashioned nightgown.Rumbling from a wagon is heard in the castle yard and the sound of horse hooves, attributed to a former bailiff who rides a horse with luminous red eyes. The white lady is walking around in the castle guarding her goods and gold. She is said to be fru Christiane Hoppe who lived from 1687 till 1769. She was the lady of the castle and the owner of a stutteri. The present owners , Inge Lise and Hermann Schimko, took over the castle in 1985 and made it open to the public. Harridslevgaard was rather dilapidated at that time, but after 15 years of restoration the castle looks like Breide Rantzau's pretty Renaissance castle. The buildings are now listed and each repair has to be done by appointment with the National Museum. Some details came up during the restoration - in the red living room was a hatch in the bottom of a cupboard, under this a spiral staircase leading down to the dungeon and a secret passage, which was an escape way for the lord and lady in the Middle Ages. 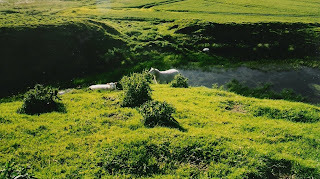 The secret passage went 500 meters out into the field to Loddenhøj or Palnatokehøj where Palnatoke supposedly was buried. It was said that Palnatoke owned "Haræslef" in the first half of the 900s. Palnatoke was probably a nickname for Toke Pallesen (also: Toke Palnesen), another possibility is den polske Toke (the Polish Toke) or den polske tolk (the Polish interpreter). The name is not a usual Nordic name. The family Schimko opened ten years ago the castle to the public by an arrangement and the interest from the public was overwhelming. Since then there have been permanent opening hours and arrangements like firm parties,conferences and weddings. People can rent historic lackeys uniforms for the servants and they can dance in Denmarks largest privately owned Knights Hall. The old mill house lies at the driveway to Harridslevgaard. The manor is surrounded by a small park with pretty peacocks. Each year Harridslevgaard has a Christmas market. The castle is by appointment open all year for tours of large groups. And it is possible to get married at the castle. The various rooms can be rented for conferences, meetings, weddings and dinner parties. - Oh my old blog. I've been away in crazy Facebook land. But I found you.. And a few old friends..
Boller Castle, East Jutland, Vejle amt. Daugbjerg church / Daugbjerg kirke, Fjends herred, Viborg amt. Gammel Estrup and Fausing church/ Fausing kirke, Sønderhald herred, Randers amt. Stouby church/ Stouby kirke and Rosenvold, Bjerre herred, Vejle amt. Fruering church/Fruering kirke, Hjelmslev herred, Skanderborg amt. Års church /Års kirke, Års herred, Aalborg amt. Gisselfeld and Bråby church/ Bråby kirke, Ringsted herred,Sorø amt, Zealand. Øls church / Øls kirke, Hindsted herred, Aalborg amt. Hammer church / Hammer kirke, Kær herred, Aalborg amt.